Bearded Dragons are definitely one of the best pet lizards you can own. They are relatively easy to care for, and can have a really nice disposition. Roughly 90% of them seem to come pre-tamed and seem to have no trouble with handling and light playing. That doesn't mean there aren't a few rough ones in the bunch, but generally all Bearded Dragons react well to them being handled gently with respect. They probably rank second or at least third for best pet lizard for a beginner. They can grow to a length of 23 inches, but usually wind up in the range of 16 to 22 inches. 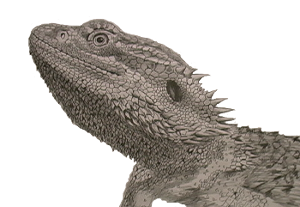 Be sure to check out the Lizard store for several fun bearded dragon products. For successful bearded dragon care -be sure and get one that's been bred in captivity, as the ones caught in the wild apparently can be unpredictable and difficult to keep healthy. Before you purchase a lizard make sure there is a vet in your area that has experience with reptiles. These bearded dragon facts will help you, but a qualified veterinarian will make sure you succeed in giving proper bearded dragon care. Check out the page on bearded Dragon shedding tips to learn more about how to help your pet bearded Dragon through his shedding process. Make sure you do the proper research that enables you to make an educated decision on whether or not a pet bearded Dragon is the best pet for you! There are very few reasons why you wouldn't want a beardie compared to a different type of lizard, but you never know -this species may not be for you. It is a common practice to make sure the size of the insect offered should not be bigger than the width of the lizard's mouth. In fact, the insect should be a decent size smaller than the lizard's mouth. I've never cared for a baby beardie, but apparently an abundance (possibly 20 to 50 insects, in this case we'll use crickets) should be offered to a baby bearded Dragon -a day(spread out on two separate feedings). Yes, it can get expensive. In addition to this, fresh veggies should be offered daily, even though your baby bearded dragon might not eat much of the veggies -if any. After about a year, I slowly moved my pet lizard's diet to primarily fresh veggies with crickets three times a week. As an adult your dragon might tend to prefer the fresh veggies. I also, a few times a year, purchase horn worms or silkworms to give to my adult bearded dragon. Dandelion greens, mustard greens, collard greens, and turnip greens are all good veggies to offer for proper bearded dragon care. you probably shouldn't be eating it let alone your pet lizard! I have not gotten into feeding my bearded dragon anything other than collard greens, dandelion greens, turnip greens and mustard greens -with the protein supplement of crickets or hornworms. Studying these bearded dragon facts might prevent a trip to the vet later. Providing a water dish is probably not a good idea, it can be a cesspool for bacteria. It also raises the humidity level (which is not healthy for a beardie). If you go with the water dish, you need to change it daily because pet lizards apparently have a lovely habit of defecating in their water dish. A good way to provide water is to spray mist their salad. You should be giving your pet bearded dragon a bath once a week, your dragon is apt to grab a drink there as well. A good bearded dragon habitat should be no smaller than 75 gallons, depending on the size of your bearded dragon. Bearded dragons might tend to be territorial, so housing them together apparently can be a problem. Evidently two female bearded dragons can be housed together, but even then their behavior should be monitored. If one is eating more than the other, or if one seems to be overpowering the other in any way shape or form it's probably a good idea to put them in separate cages. Never put two males together. It's up to you to provide good bearded dragon care so that the stresses of captivity won't take effect on their brain. Furniture or stuff for your lizard to climb on, engage with, or hide under should be provided. When possible you want to try to combine something to climb up on -and with something to hide under. This saves on floor space. Check out this video that creates a fake rock wall that incorporates something to climb on, a basking spot, and a hiding place. Ideally, for a good bearded dragon habitat you want two hides, one on the hot side -and one on the cold. This allows your pet lizard to regulate its temperature. As far as a substrate(material or substance on the ground) I've seen everything from newspaper, paper towels or play sand. Sand in general is not encouraged because of the risk of impaction. If your pet lizard, while eating a cricket or a veggie, gets some sand in its mouth -it could consume the sand. This isn't good as the sand could get clogged in the dragon's digestive system. When discussing bearded dragon facts, this can be a bit of a controversy surrounding the sand issue. The argument for sand comes from the fact that sand is closely related to a bearded dragon's natural substrate -apparently that of loose dirt. The reality is a bearded dragon in the wild doesn't have a great chance of living beyond one year. The odds are stacked against him, and I would bet it's safe to say that impaction probably plays a role in a wild dragon's longevity. If you have to have sand in your bearded dragons habitat then put sand on just one side of the cage. Put the dragon's salad dish on the side -without sand, and feed him crickets in a separate container. As far as cleaning the cage, I "poop" my dragon every other day; that is to say I give him a warm bath in the hopes that he will poop in his bath and not on his fake rock structure. If he does happen to poop on his fake rock furniture -I use a mixture of half water and half White vinegar -in a water bottle, combined with scrubbing with paper towels. I let this air out before putting the bearded dragon back in the cage. For proper bearded dragon care, you need a heat light plus a UVB light. I use a mercury vapor bulb, as this is apparently the closest mimic of the sun available. A lot of people say they experience a different pet lizard with a mercury vapor bulb. A healthier pet lizard with more energy and life. The mercury vapor bulb also emits heat of which your lizard needs to digest its food. If you don't get a mercury vapor bulb you'll need to add a second light fixture to supply the heat. Either way you'll want the light fixtures to be ceramic-based. You need to provide a basking spot for your pet lizard. This spot needs to be in the range of 100° to 110°. You need to get a thermometer to make sure your temps are accurate, I use a temp gun. The cooler side of the cage needs to be roughly 75° to 85°. Put the light or lights on an inexpensive automatic timer. Have them on for 12 to 14 hours. You want your pet lizard to be exposed to the UVB light and heat for at least an hour before you feed him. This will apparently allow him to better be able to digest his food. Proper lighting and temperatures also contribute to a bearded dragon's ability to shed its skin. bearded Dragon shedding tips to learn more about how to help your pet bearded Dragon through his shedding process. Of all the bearded dragon facts -Brumation is the most difficult to accept and understand. It's the Reptile equivalent of hibernation. Every beardie might be slightly different when it comes to Brumation. Some will sleep for up to five months at a time, and I've heard of other bearded dragons not brumating at all. One factor might be -how long your bearded dragon's blood line has been in captivity. Other factors might be -the humidity level. Or your bearded dragon could choose to do whatever he or she wants! An adult beardie(juveniles should not brumate or be encouraged to brumate-they evidently need their protein) will usually start to slow down around October. The basking light should be maintained as normal(the UVB light) because if your beardie wakes up and decides to eat (you should provide a little food during Brumation) he will need the light to be able to digest his food. Some people lower the temps to around 72°(room temperature) to simulate the seasonal change. If you happen to notice your beardie eating during Brumation, it might be a good idea to occasionally put him on the basking spot to encourage good digestion. As with any care sheet with any pet lizard(or any other animal) it's always a good idea to read several different care sheets to learn as much as possible so your pet lizard can be healthy and happy. This is of course true with providing excellent bearded Dragon care. 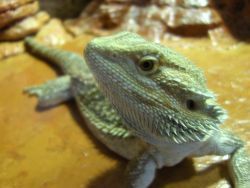 Seek out more care sheets and bearded dragon facts to enable you to provide the best possible care for your pet lizard. All information given from experience from caring for these creatures, and open dialogue from the internet. Share your bearded dragon care tips or stories! Do you have some helpful or fun stories that could aid a fellow bearded Dragon owner? Do you have a picture to add? Great! Click the button and find it on your computer. Then select it. If the picture is larger than 800x600 pixels it will automatically be resized. Or just submit a picture that is that size or smaller. My bearded dragon is very inactive and we are SOoo in love with him!